Looking for a lightweight tent that can be packed up and setup without a truck or trailer and with minimum tools. Our 20' Wide Standard Canopy Tents with Sidewalls are the answer. This standard pole tent will provide quick and easy protection from the elements at your next casual gathering. The standard pole tent is light, easy-to-transport and can be setup quickly. This is our deluxe economy pole tent package. The 20' Wide Standard Pole Tent with Sidewalls is a fantastic package for rental companies as well as individuals that host parties in their backyard. 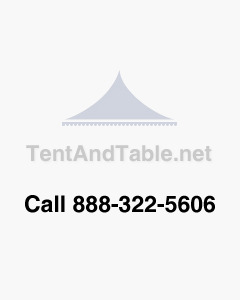 This tent is great for weddings, rehearsal dinners, bridal parties, baptisms and more. Anodized aluminum keeps the poles from oxidizing. This tent is 100 percent waterproof commercial vinyl.